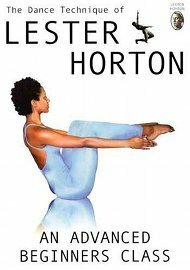 This advanced beginners class was created to show the Lester Horton techniques incorporated and taught within a class. This program includes a warm up, round over and round up, flat back series, primitive squat descent and ascent, lateral stretches, release swing series, fortification #1, prelude #1, twists with open Egyptian arms, leg swings, stag position balance, coccyx balance, improvisation, center floor work and much more. I had mixed feelings about this instructional video. It's a great workout, and helped a lot with my contemporary technique. Aaaand, I'm not sure it should be labeled as an "advanced beginner" class. The teaching style of the first instructor in the video requires you to already know a fair bit about contemporary technique, and to be able to process and remember verbal instructions that are only given once, and are delivered quite rapidly. I'm at the advanced beginner/intermediate level, and this video's pacing seemed more like that of an *advanced* video--not an advanced beginner one.